BSE Sensex closed higher by 282.48 points, or 0.78%, to 36,548.41, while the Nifty 50 rose 74.90 points, or 0.68%, to close at 11,023.20. 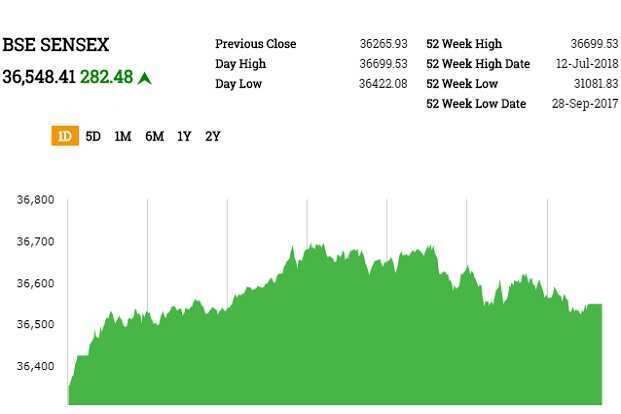 During the day, Sensex hit an all-time high of 36,699.53, while Nifty 50 touched a record high of 11,078.30. On the other hand, BSE MidCap and SmallCap ended in negative territory by falling 0.52% and 0.06%, respectively.Among the sectoral indices on BSE, energy gained most at 3.07% followed by oil and gas 1.60%, bankex 0.92% and finance 0.91%. Realty, auto, IT, teck and basic materials declined most.Reliance Industries led the gains and rose 4.42%. BPCL, Wipro, L&T and HDFC were among other top gainers. Vedanta, Infosys, Bajaj Auto and Mahindra were among the major losers.Meanwhile, foreign investors bought shares worth a net of Rs 636.27 crore on Wednesday, while local investors purchased shares worth a net of Rs 15.33 crore, provisional data showed. Shares of Karnataka Bank Ltd jumped 7.25% to Rs127.15. The bank said its first-quarter net profit rose 21.96% on the back of higher interest income and lower employee cost. Net profit rose to Rs 163.24 crore for the three months ended 30 June from Rs 133.85 crore in the same quarter last year. Net interest income, or the difference between interest earned on loans and that paid on deposits, increased 10.40% to Rs 468.58 crore from Rs 424.42 crore in the corresponding period last year. Cadila Healthcare Ltd shares fell 2.28% to Rs 363 after the company said that a unit of Zydus Cadila, Zydus Hospira Oncology, has received an establishment inspection report (EIR) from USFDA concluding the the inspection as closed and classifying the facility as ‘Voluntary Action Indicated’. Zydus Hospira Oncology is a 50: 50 joint venture company between Zydus Cadila and Hospira Inc. USA. Trent Ltd notched up volume of 70180 shares on BSE, a 5.21 fold spurt over two-week average daily volume of 13482 shares. The stock rose 1.50% to Rs.356.40. Volumes stood at 28597 shares in the last session.HDFC Standard Life Insurance Company Ltd witnessed volume of 2.2 lakh shares by 10:47 IST on BSE, a 3.53 times surge over two-week average daily volume of 62302 shares. The stock increased 1.62% to Rs.476.65. Volumes stood at 54707 shares in the last session.Mangalore Refinery And Petrochemicals Ltd added 4.99% to Rs 80.95. The stock was the fourth biggest gainer in ‘A’ group. On the BSE, 1.71 lakh shares were traded on the counter so far as against the average daily volumes of 1.2 lakh shares in the past one month. The Indian rupee strengthened against the US dollar on Thursday, tracking gains in equity market. At 2.01pm, the rupee was trading at 68.54 a dollar, up 0.34% from its Wednesday’s close of 68.77. It opened at 68.75 a dollar and touched a high and a low of 68.51 and 68.76, respectively.The 10-year bond yield was trading at 7.82% compared to its previous close of 7.87%. Bond yields and prices move in opposite directions. So far this year, rupee lost 6.83%, while foreign institutional investors have sold $887.88 million in equity and $8.71 billion in debt, respectively. Time Technoplast Ltd spiked 6.44% to Rs 143.75. The stock was the biggest gainer in the BSE’s ‘A’ group. On the BSE, 84799 shares were traded on the counter so far as against the average daily volumes of 36161 shares in the past one month.GMR Infrastructure Ltd surged 6.18% to Rs 18.05. The stock was the second biggest gainer in ‘A’ group. On the BSE, 11.3 lakh shares were traded on the counter so far as against the average daily volumes of 19.41 lakh shares in the past one month.India Cements Ltd soared 5.66% to Rs 114.85. The stock was the third biggest gainer in ‘A’ group. On the BSE, 3.84 lakh shares were traded on the counter so far as against the average daily volumes of 3.18 lakh shares in the past one month. Shares of Reliance Industries Ltd (RIL) jumped sharply today, helping its market capitalisation touch $100 billion. RIL shares rose as much as 5% to a day’s high to ₹ 1,091, giving the company a market cap of close to ₹ 6.9 trillion. Schaeffler India Ltd notched up volume of 5006 shares on BSE, a 24.54 fold spurt over two-week average daily volume of 204 shares. The stock slipped 0.84% to Rs.5,500.00. Volumes stood at 66 shares in the last session.Persistent Systems Ltd registered volume of 3.06 lakh shares on BSE, a 12.37 fold spurt over two-week average daily volume of 24768 shares. The stock slipped 0.30% to Rs.841.50. Volumes stood at 1.78 lakh shares in the last session.Inox Leisure Ltd recorded volume of 2 lakh shares on BSE, a 8.44 times surge over two-week average daily volume of 23709 shares. The stock lost 0.97% to Rs.255.15. Volumes stood at 2434 shares in the last session. Shares of Coffee Day Enterprises Ltd rose 2.39% to Rs 270.35 after the company said it has signed an agreement with UberEats for distribution of food products for five years. The announcement was made after market hours on 11 July. Larsen and Toubro Ltd (L&T) on Thursday said its construction unit, L&T Construction, has received orders worth ₹ 2,388 crore. The order was received by the water and effluent business. Shilpa Medicare Ltd on Thursday gained most in 21 months, after it received the establishment inspection report (EIR) from US FDA. Shares of Shilpa Medicare jumped as much as 13.8% to ₹ 434, their highest since 29 May. The stock posted the biggest intraday percent gain since 26 October 2016. An EIR clears the way for exports from the facilities to the United States.Over 467,000 shares change hands, compared with their 30-day moving average of 22,202 shares. The stock is down 38% this year, as of last close. BSE Sensex surges 1.11%, or 404.20 points, to 36,670.13 points. Nifty up 1.06% to 11,064.75 points. Airline stocks jumped after crude oil prices posted their biggest one-day drop in two years. Interglobe Aviation Ltd, which owns India’s biggest carrier IndiGo, and Jet Airways (India) Ltd trade 4% higher, while SpiceJet Ltd gains over 3%.Global benchmark Brent crude slumped nearly 7% on Wednesday as escalating US-China trade was threatened to hurt oil demand, and news that Libya would reopen its ports raised expectations of growing supply. Shares of HCL Technologies Ltd gained as much as 2.48% to Rs 1019.70 after the company’s board of directors will meet today to consider the share buyback proposal. Analysts largely believe the size of the buyback would be around Rs 3,500 crore. Last year, it had offered buy-back of shares at Rs1,000 apiece, a 17% premium over its prevailing trading price at that time.According to Edelweiss Securities, HCL Tech is estimated to clock 1.7% constant currency revenue growth in the June 2018 quarter and margin is expected to remain flat. “Management is expected to maintain revenue growth and margin guidance for FY19. Traction in ER&D business, strategy behind acquisitions, update on IP deals and outlook on IMS business are key monitorables”, added Edelweiss. Alembic Pharmaceuticals Ltd shares rose 2.45% to Rs 531.60 after the company said that it has received tentative approval from USFDA for its abbreviated new drug application Ticagrelor tablets, equivalent to the reference listed drug product Brilinta Tablets of Astrazeneca Pharmaceuticals LP. The drug has an estimated market size of $625 million for 12 months ending December 2017, according to IQVIA. 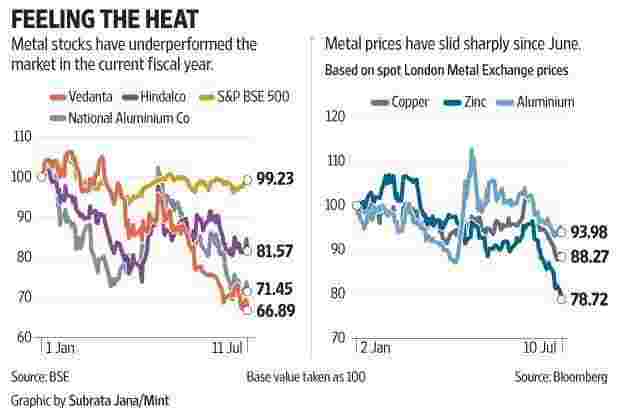 Metal stocks have underperformed the market in the current fiscal year. TCNS Clothing Co. Ltd will launch its Rs 1,125 crore initial public offering on 18 July. The company has priced its shares in range of ₹714-716. The public offer closes on 20 July. The IPO is a pure offer for sale by the existing shareholders and TCNS does not intend to raise any fresh capital. Promoters of the company, along with private equity investor TA Associates, are selling 15.71 million shares or 25.63% stake through the IPO. TA Associates is selling 11.27% stake that will fetch ₹495 crore at the upper end of the price band. TA Associates holds 40.6% in TCNS Clothing. Shares of Novartis India Ltd fell over 1% to Rs 668.20, while Themis Medicare shares dived 6.66% to Rs 381.50 in the opening trade. India’s drug regulator has ordered the withdrawal of the popular diclofenac painkiller injection marketed by Novartis India and made by Themis Medicare Ltd, following safety concerns raised by a health ministry panel. The drug controller general of India (DCGI) on 4 July directed the state drug controller in Dehradun, Uttarakhand, and the drug licensing authority of Daman and Diu to cancel the manufacturing licence granted to Themis Medicare for diclofenac sodium injection 75 mg/ml using Transcutol-P.
Shares of Fortis Healthcare rose 2.50% to Rs 141.25 after The Economic Times reported that Malaysian healthcare giant IHH Healthcare is poised to win the bid for Fortis after it offered to pay Rs 180/share, valuing the hospitals chain at Rs 9,335 crore. Moreover, Fortis board would meet on 13 July to consider raising funds through issue of securities on a preferential allotment basis. Shares of oil companies advanced after Brent oil prices slumped 6.9% on Wednesday in its biggest one-day drop in two years. However, Brent crude rose 1.8% on Thursday on news that Libya would resume oil exports and US-China trade tensions. Nifty Energy Index was up nearly 2% led by HPCL, IOC, BPCL and Reliance Industries. 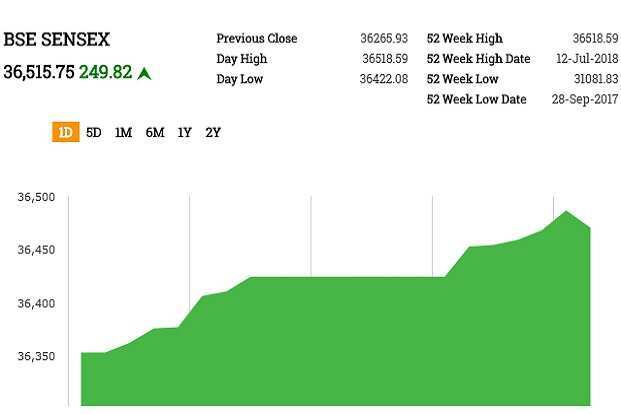 BSE Sensex surged 249.82 points, or 0.67%, to 36,515.75, while the Nifty 50 jumped 66.90 points, or 0.61%, to 11,015.20. BSE MidCap and SmallCap advanced 0.87% and 0.69%, respectively.All the sectoral indices on BSE, except telecom, gained with oil and gas, energy and bankex rising over up to 1.98%. Reliance Industries rose 2% to trade at an time high. SBI, Yes Bank and HPCL and BPCL were among other top gainers. Mahindra, TCS, Adani Ports and Wipro were among the major losers. BSE Sensex traded higher by 189.68 points, or 0.52%, to 36,455.61, while the Nifty 50 rose 58.65 points, or 0.54%, to 11,006.95.